Log siding is a versatile building product that can be used to create the look of a full log home at a fraction of the price or just add a natural look throughout a home. 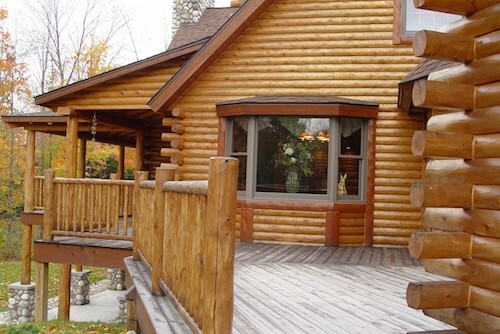 Log siding comes in a variety of profiles to create designs from rustic to contemporary. Take a look at the different log siding profiles available and how they can be used to construct different looks. Log siding is available in different cuts and sizes, and knowing the benefits of each will help you know which material is right for your project. The most popular sizes are quarter log and half log. Quarter log siding is 2” thick with a slightly rounded face. It’s an affordable option that is easy to install. Half log siding is a thicker option (3”) with a more rounded face than quarter log. This size is best for achieving a true log home look, yet it still offers cost-saving benefits over full stacked log construction. Close your eyes. Picture a log home. What are some features that immediately come to mind? Soaring trusses? Yes. Warm wood walls? Of course. A roaring fire in the fireplace? Absolutely. 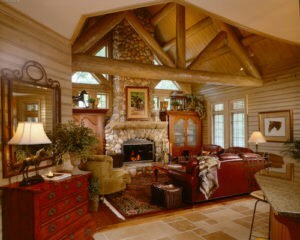 While all of these are quintessential elements of log home design, the fireplace is often at the heart of a log home. Not only do fireplaces add warmth, they also create endless decorating opportunities — particularly around the holidays. And it’s the fireplace mantel that helps frame this popular design element and transform it into a focal point in a home. It’s easier than you think to get the look and feel of a stunning stacked full log home without the cost and maintenance worries that are often deal killers for home owners. Log siding can transform almost any build into a log home, whether you’re building from the ground up or altering an existing conventional frame. Log siding can be used in both the interior and exterior of a home to add natural beauty and a rustic appearance. An added bonus — it comes at a fraction of the cost of building a stacked full log home! The walls of your log or timber frame home wrap you with protection. They keep you safe from the elements and harmful UV rays. They keep you warm in the winter and help you stay cool during summer. All the while, your walls bear the brunt of all that Mother Nature has to throw at them. Luckily, there are simple steps you can take to protect the walls of your log home. It all starts with smart design and ends with regular maintenance. Like with any home, a log home require routine maintenance to keep it looking good and in good condition. 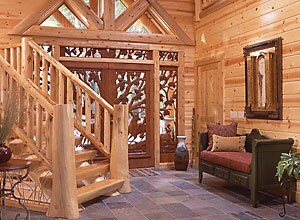 However, there are a few things that are unique to maintaining a log home. Review these five tips to help ensure that your wood surfaces remain at their best for many years to come. Choosing the right wood products when you build your log home will save you time, effort and maintenance costs down the road. Northern White Cedar is a top choice because it’s very resistant to insects, rot, decay, and shrinkage. Additionally, White Cedar’s light, consistent coloring holds finishes well, and much like cork, it will not absorb moisture.